Although I'm not currently planning my big day, putting together Oregon Bride magazine feels just like coordinating a wedding. I'm looking for dresses for our fashion spreads, visiting new reception venues, working with florists to design custom bouquets for the next issue -- there is always a mile-long to-do list waiting for me in the morning! So in the midst of this last action-packed weekend, I took a little beauty break. Looking good makes you feel good, and feeling good relieves stress and keeps you motivated so you remember to have fun with the planning process. I discovered a couple great Portland spots to get pampered and encourage you to do the same. Don't neglect yourself! Tons of my friends have recommended UrbanWaxx since it opened in 2007, but I've stubbornly stuck to my razor to save money. But I always say that if I could afford it, I would choose wax for all my hair removal needs. The smoothest and longest lasting results are worth the few minutes of pain. So I finally treated myself and it was so worth it! 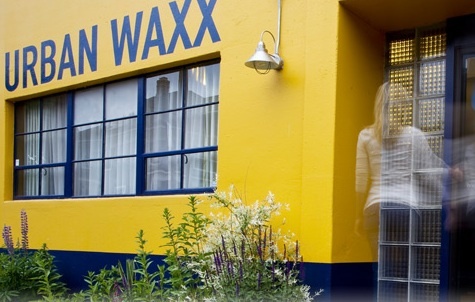 These ladies are experts in giving the quickest and cleanest waxes you'll ever experience. I promise. Then wanting to finish up with something I could actually flaunt around town, I searched for mani/pedis on the Yelp iPhone app and discovered Midas Nail Spa. A small spot, nothing fancy, above Vivace Coffee Shop on NW 23rd, I picked it above the rest because of their special promo: spa manicure and pedicure for only $35 when you mention Yelp. Well, that's easy! The price was right for over an hour of service and polish that still looks as good as new. And as I was waiting for my nails to dry, two friends took their seats in the pedicure chairs and immediately started discussing their wedding plans. Looks like great (bridal) minds think alike.